The Indian foundry industry manufacturers metal cast components for applications in Auto, Tractor, Railways, Machine tools, Sanitary, Pipe Fittings, Defence, Aerospace, Earth Moving, Textile, Cement, Electrical, Power machinery, Pumps / Valves, Wind turbile generators etc. Foundry Industry has a turnover of approx. USD 19 billion with export approx. USD 2.5 billion. There are approx 5000 units out of which 90% can be classified as MSMEs. Approx 1500 units are having International Quality Accreditation. Several large foundries are modern & globally competitive. Many foundries use cupolas using LAM Coke. However, these are gradually shifting to Induction Melting. There is growing awareness about environment & many foundries are switching over to induction furnaces & some units in Agra are changing over to cokeless cupolas. India to become fastest growing economy >7.5% YoY as per forecasts of leading International Institutions. Typically, each foundry cluster is known for catering to some specific end-use markets. For example, the Coimbatore cluster is famous for pump-sets castings, the Kolhapur and the Belgaum clusters for automotive castings and the Rajkot cluster for diesel engine castings, Howrah cluster for sanitary castings etc. The total Manpower in Foundry Sector is approx. 500,000 Directly & 150,00,00 indirectly. The foundry sector is highly labour intensive & currently generates employment for 2 Millions directly & indirectly mainly from socially & economically weaker sections of society. It has potential to generate additional employment of 2 Million in next 10 years. Auto industry grew at an average rate of 5 .4% in 2016-17 compared to previous year . The Society of Indian Automotive Manufacturers (SIAM) forecast a 7 to 9% growth for the domestic passenger vehicle sales in the financial year 2017-18, expecting support from 7th pay commission payout and better rabi output. 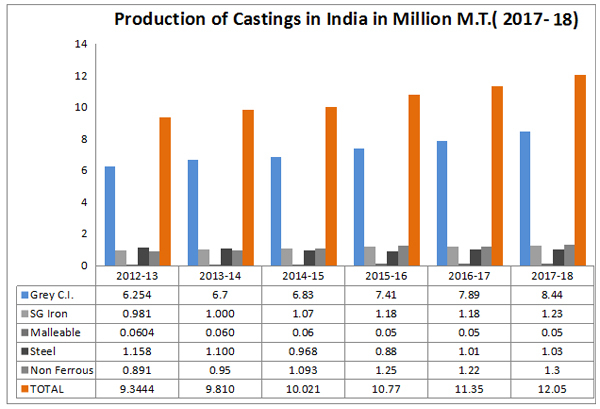 As per 51th World casting Census published by Modern Castings USA in December 2017, Global Casting Production Stagnant. Worldwide casting production grew by less than half a percent for second year in a row in 2016. In 2016, world casting production reached 104.4 million metric tons, a shade over the 104.1 million metric tons produced in 2015. 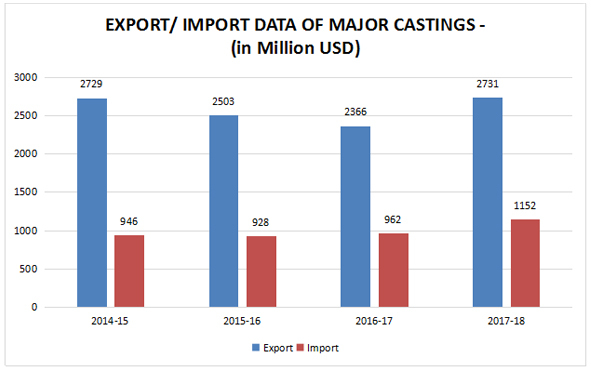 The World’s top 10 casting producing nations produced 91.6 million metric tons of the total 104.4 million metric tons. The Exports have been showing healthy trends approx 25-30% YOY till 2011-12 after that there was slow down in export. However, the current exports for FY 2016-17 are approx USD 2.33 billions. 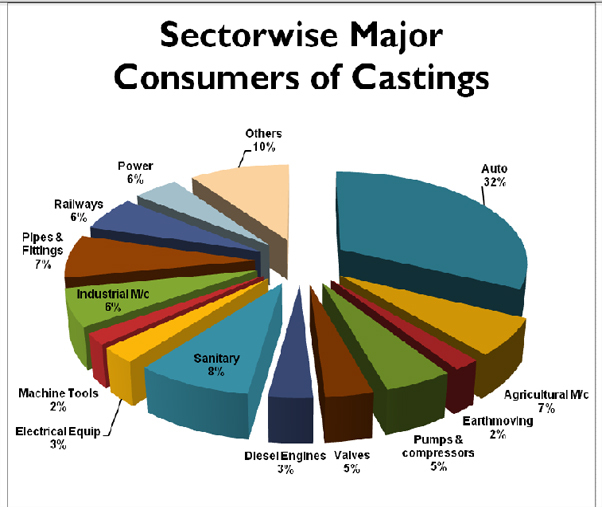 Automobile Sector is major consumers of castings, Please see the Chart Below.